Congrats and welcome back to co-host Elizabeth and her new baby girl! But do we actually need that? 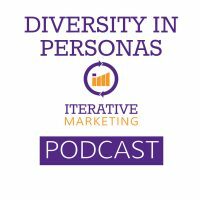 So in that instance, a lack of diversity in personas could lead to inadvertently making marketing materials that kept the status quo. That made minorities feel uncomfortable, even as they made the majority feel comfortable. But to make the personas minorities would bring along a lot of extra baggage. A lot of unsaid struggle or discrimination. They would make them into something the majority of the audience was not. How are these minority personas different? If your goals are membership or any diversity growth, definitely build your majority first, then double check against your minority personality. If applicable, also address the minority. If you do have both majority and minority, every marketing piece should be built with the majority audience in mind, and then carefully examined through the eyes of the minority persona to make sure it has the same desired effect.